>> Brand-new and High-speed LCD shutter technology, with High contrast, high brightness images provide one of the brightest solutions on the market. The glasses also avoid ghosting. Due to the extremely precise presentation your 3D experience is improved at all. With wider review vision, you can enjoy the stable, high definition and bright 3D images from any corner. Even if you are lying, with Hi-SHOCK's DLP-LINK glasses, you will be able enjoy 3D images. >> Low power consumption, low battery detection and high capacity rechargeable battery, provide the longest work life for the glasses! It adopts the American low power consumption IC and self low battery detection design, and the high capacity rechargeable battery which can be recycled. The LED indicator shows current charging status. Intelligent switching circuits turn off the glasses after 5 minutes if they are unused. 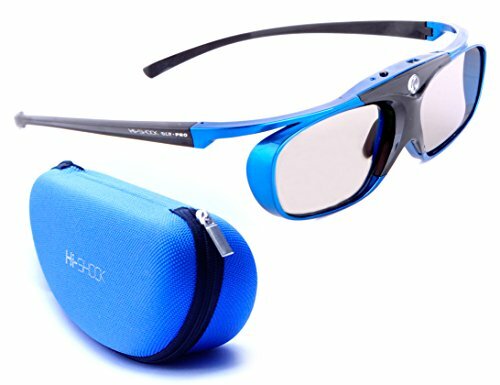 >>The creative fashion design of Hi-SHOCK DLP-LINK Shutter 3D Glasses, represent the passion for life. The exclusive Hi-SHOCK accessories complement our product range ideally. From hardcases for safe storage of high-quality 3D glasses to replacements, adaptors & care products - Hi-SHOCK is always the right choice. If you have any questions about this product by Hi-SHOCK, contact us by completing and submitting the form below. If you are looking for a specif part number, please include it with your message. Optical Prime 3D (5 Pack) 3D Cinema Glasses For Passive TVs – Movie Theater Glasses - Circular Polarized.